Following-up on a collaboration in 2017 where Hostess [®] products appeared in an Angry Birds game, select packages of Hostess treats are now showcasing an exciting partnership allowing every person who downloads Angry Birds Match to receive free Gems. The Gems, a $4.99 value, are a form of currency in Angry Birds Match that can be used to purchase keys to unlock premium chests, refill lives or purchase boosters, or extra moves for the levels. Free Gems are available to players in the USA, through 9/28/18, with new game downloads only and a limit of 1 per person. To sweeten the promotion, the select packages of Hostess treats are also offering a chance to experience tropical locales, as seen in the Angry Birds Movie and Angry Birds games, by winning a trip to Hawaii. This sweepstakes grand prize consists of a trip for four people to Hawaii through Delta Vacations. The 5-day, 4-night trip includes round trip air transportation to Oahu, lodging for four people, and airport transfers. While no purchase is necessary to enter, information on the free Gems and entry to the sweepstakes can be found on select multipacks of Hostess [® ] CupCakes, Twinkies [®] , Ding Dongs [®] , Ho Hos [®] , Raspberry Zingers [®] , and Hostess [® ] Cinnamon Streusel Coffee Cakes. “Delta Vacations is excited to partner with such an iconic American snack brand, as well as one of the originators of innovation in mobile gaming. The ingenuity and creativity of the teams involved allowed for seamless collaboration, and we are extremely pleased with the outcome of this opportunity,” said Renee Mathewson, Corporate Communications Lead at Delta Vacations LLC. Full sweepstakes rules and guidelines can be found on select packages of Hostess [® ] CupCakes, Twinkies [®] , Ding Dongs [®] , Ho Hos [®] , Raspberry Zingers [®] , and Hostess [® ] Cinnamon Streusel Coffee Cakes. Spark Alliance Marketing served as the agency that worked with Hostess on the concept and execution of the promotion. An icon of American ingenuity, Hostess [®] treats have been some of the world’s best known sweet baked goods for nearly a century. The category pioneer continues to lead the way in innovation, quality and creativity that captures the imagination of snack cake enthusiasts generation after generation. 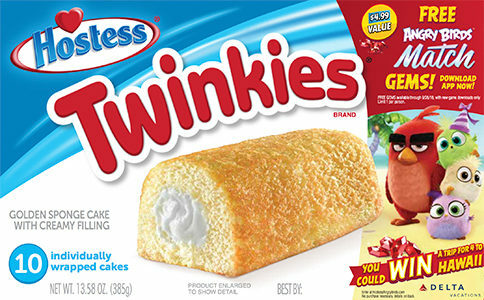 Hostess Brands, LLC is headquartered in Kansas City, Missouri, and operates bakeries in Emporia, Kansas, Columbus, Georgia, Indianapolis, Indiana, and Chicago, Illinois. Rovio Entertainment Corporation is a global entertainment company that creates, develops and publishes mobile games, which have been downloaded over 4 billion times. The Company is best known for the global Angry Birds brand, which started as a popular mobile game in 2009, and has since evolved from games to various entertainment and consumer products in brand licensing. Today, the Company offers multiple mobile games, animations and has produced The Angry Birds Movie, which opened number one in theatres in 50 countries and the sequel of which is planned to be released in 2019. Delta Vacations, the official vacation provider for Delta Air Lines DAL, +0.36% offers convenient, one-stop shopping for vacation packages that bundle flights aboard Delta and its strategic partners – Air France, KLM, Alitalia, Aeromexico and Virgin Atlantic – with stays at more than 4,700 hotels and resorts in more than 300 of the world’s top leisure destinations. Delta Vacations also offers rental cars and hundreds of exciting activities, tours and excursions that can be added to vacation packages. Delta Vacations has earned numerous industry awards including Travel Weekly Readers Choice Awards. Delta Vacations is managed by MLT Vacations, a wholly-owned subsidiary of Delta Air Lines. For more information visit www.delta.com/vacations or follow Delta Vacations on Twitter and Instagram @deltavacations.